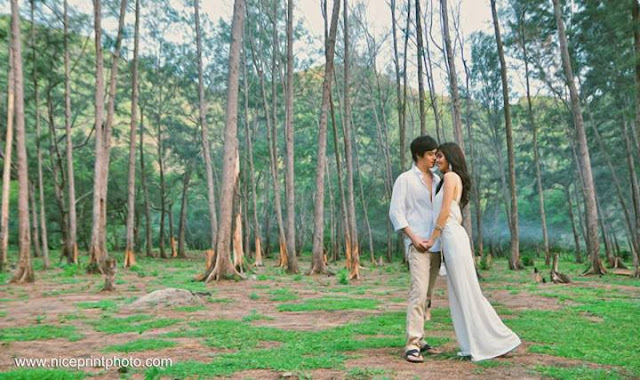 I think most of you saw the official engagement photos of Lloyd Lee and Shamcey Supsup. Like they said in the news, the lovely couple observed Ting Hun or the traditional Chinese engagement party on Father's Day. It signifies the acceptance of both families of their future daughter or son-in-law. Now Shamcey Supsup and Lloyd Lee's wedding supplier in terms of photography just posted their Anawangin e-session in Facebook. I stumbled upon them and got very amazed so I'm sharing them here. At first I didn't have any idea on what an e-session is. I just learned that it is actually a short term for "engagement session" wherein the newly engaged couple go to their chosen location for souvenir shoot. Anawangin, Zambales is such a perfect place for the e-session. Look at them romantic couple and the clear water and the ripples. Ahhh... you know what I mean. The Miss Universe 2011 3rd Runner Up must be feeling like walking in the clouds during the session. They took really gorgeous shots. Super bagay sa scenery. Let me caption this this way.. spell happiness and contentment. As early as now, I am saying my best wishes to the bride-to-be. shamcey's pretty, the fiance isn't unfortunate looking either. this will be one good looking family for sure. kudos to them for staying together even after the miss universe pageant.